The Travers Stakes is an American Grade I Thoroughbred horse race held at Saratoga Race Course in Saratoga Springs, New York. It is nicknamed the "Mid-Summer Derby" and is the third-ranked race for American three-year-olds according to international classifications, behind only the Kentucky Derby and Belmont Stakes. First held in 1864, it was named for William R. Travers, the president of the old Saratoga Racing Association. His horse, Kentucky, won the first running of the Travers. The race was not run in 1896, 1898, 1899, 1900, 1911, and 1912. The race is the highlight of the summer race meeting at Saratoga, just as the Belmont Stakes is the highlight of the spring meeting at Belmont Park. The purse was increased to $1,000,000 in 1999 and then to $1,250,000 in 2014. The purse for the 2015 renewal was increased to $1,600,000 due to the presence of Triple Crown winner American Pharoah. 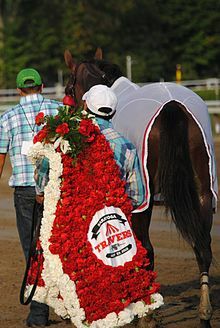 The Travers is run at scale weights: colts and geldings carry 126 pounds (57 kg) and fillies carry 121 pounds (55 kg). The winner of the race is presented with a blanket of carnations, which is approximately 10 feet long and requires about 1,500 flowers. The carnations are red and white, which are the colors of Saratoga Race Track. The blanket is prepared the night before the race by a Saratoga florist. The winner's trophy, known as the Man o' War Cup, was designed by Tiffany and Co. Its namesake, Man o' War, won this race in 1920. The wife of owner Samuel Riddle donated the trophy in 1936 as the permanent award for winning the race. Each year, the name of the winner is inscribed on the Cup. A gold-plated replica is presented to the winner each year by a member of the Riddle family. Since 1961, the colors of the Travers winner have been painted onto a canoe which sits on a pond in the infield. The canoe itself has been a fixture at the track since 1926. In 1941, Whirlaway became the only horse ever to win the both the American Triple Crown and the Travers Stakes, sometimes referred to as a "superfecta". In 1962, arguably the greatest Travers in history took place. Jaipur won by a nose-bob in track record time over the arguably more talented Ridan after a long, head-to-head battle over the entire mile and a quarter. Still written and talked about today, the race is listed in the 2006 book Horse Racing's Top 100 Moments written by the staff of Blood-Horse Publications. The race result determined which colt would be named the 1962 U.S. Champion 3-Year-Old Horse. In 1982, Runaway Groom, the Champion Canadian Three year old arrived at Saratoga after competing in the Canadian Triple Crown, having won the Prince of Wales Stakes and Breeders' Stakes, and finishing second in the Queen's Plate. At the Travers that year, Runaway Groom became the 2nd horse in racing history to beat the three winners of the Triple Crown series in the same race, defeating Kentucky Derby winner Gato Del Sol, Preakness Stakes winner Aloma's Ruler, and Belmont Stakes winner Conquistador Cielo. Sun Briar was the first to do so in the 1918 Travers Stakes. 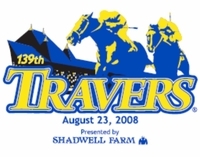 The 1997 Travers was another of the memorable races in its history, as it saw U.S. Racing Hall of Fame jockeys Jerry Bailey and Chris McCarron (aboard Behrens and Deputy Commander respectively) in a home-stretch duel wherein Deputy Commander prevailed. Adding to the drama was a thunderstorm which produced hail 24 hours before the race, and the uncertainty around whether or not McCarron would be present after the recent death of his mother. In 2001, Point Given won the Travers before a record Travers Stakes day attendance of 60,486. The total betting handle was $34,529,273, which was a Saratoga record at that time. On August 25, 2012, Alpha and Golden Ticket finished in a dead heat for first place – meaning they could not be separated in the photo finish. Following the race, two canoes were put in the infield pond to commemorate the winners. It was the first official tie in the race's history. In 1874, Attila and Acrobat dead heated but were forced to run off to break the tie. The 146th Travers Stakes was run on August 29, 2015. Because Triple Crown winner American Pharoah was in the race the purse was raised to $1.6 million and NYRA capped attendance at 50,000, making the event a sellout for the first time ever. 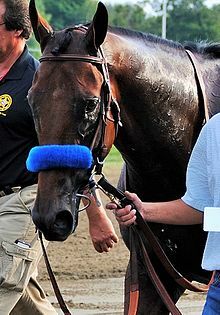 The 2015 race reaffirmed Saratoga's reputation as the "graveyard of champions" when Keen Ice defeated American Pharoah. The 147th Travers was equally notable as Arrogate rolled home to win by 13 1/2 lengths and set a new stakes record, finishing the race in 1:59:36. Arrogate's victory helped Bob Baffert to avenge his loss the previous year with American Pharoah. The 1921 Travers Stakes is known for a betting scandal. In those days, bookmaking rather than parimutuel wagering was the primary method of taking bets on horse races. The original field was fairly light with the favorite, the filly Prudery, owned by Harry Payne Whitney, facing no serious competition. Then Arnold Rothstein entered his colt, Sporting Blood, ostensibly to pick up second place. A few days before the race, however, Rothstein had learned that Prudery was off her feed. He knew he might have a real chance to win. Initially, the odds on the filly were 1-4 while Rothstein's colt was at 5-2. On the day of the race, however, a leading three-year old, Grey Lag, was entered by trainer Sam Hildreth. Grey Lag immediately became the favorite, with Prudery the second choice, driving the odds on Sporting Blood up to 3-1. Rothstein bet $150,000 on his horse. Just before post time, Grey Lag was scratched with no explanation. During the race, Sporting Blood overtook the ailing Prudery gaining his owner nearly a half million dollars, including wagers and the purse. Although many smelled foul play, it was never proven that Hildreth received any payoff or that there was a conspiracy between him and Rothstein. To date, Whirlaway is the only Triple Crown winner to win the Travers Stakes. All other Triple Crown winning horses have finished 2nd or worse. The 2018 Triple Crown winner, Justify, did not race in the Travers Stakes having been retired in July 2018 due to health concerns over a possible leg condition. ^ a b "Travers Stakes Profile". www.equibase.com. Retrieved 5 September 2016. ^ "Arrogate captures Travers Stakes, 'Mid-summer Derby,' in record time". USA Today. Retrieved 5 September 2016. ^ "The world's top 100 races" (PDF). ifhaonline.org. Retrieved 5 September 2016. ^ "Floral Winner's Blanket Creator Susan Garrett Interviews With Saratoga.com". www.saratoga.com. Retrieved 5 September 2016. ^ a b c d "2016 Travers Stakes at Saratoga: August 27". www.saratogaracetrack.com. Retrieved 5 September 2016. ^ "See Man o' War Cup on Monday". saratogian.com. Retrieved 5 September 2016. ^ Heller, Bill (2004). Saratoga Tales. Albany, N.Y.: Whitston. pp. 4–5. ISBN 0-87875-551-9. ^ "Point Given rules Travers". a.espncdn.com. Retrieved 5 September 2016. ^ Drape, Joe (25 August 2012). "Travers Ends in Dead Heat Between Alpha and Golden Ticket". The New York Times. Retrieved 5 September 2016. ^ "NYRA Caps Travers Day Attendance at 50000". Blood-Horse. 2015-08-06. Retrieved 2015-08-06. ^ "Keen Ice springs Travers upset on 'Pharaoh'". 2015-08-29. Retrieved 2015-09-01. Ten Things You Should Know About the Travers Stakes at Hello Race Fans! This page was last edited on 27 March 2019, at 02:10 (UTC).